Just as our little bundle of joy begins to grow, talk and animate – pretend comes into action. When we talk about pretend play, it simply means that children, often accompanied by parents, pretend to be someone or something they are not, for the sake of play. In very simple words, acting like someone or something is pretend play. For example, when children want to pretend like their teacher at home and make you the student, try to teach you and pretty much re-enact what happened in class, it is a pretend play. Or when they pretend to be a superhero who save a baby doll from a calamity, it is pretend play. But is Pretend Play really important? If it is crucial, then why? What difference does it make in a child’s growth and development? Let’s find out in this blog. When we let our children play by pretending, parents and children, mutually learn a lot. Pretend play is often a result of what the child has seen in their day to day lives. How their teacher treats them in class? What kind of interactions they have with their friends at the park? How did Spiderman treat the villain or how Elsa likes to dress up (a reflection of their screen time)? Their pretense and imagination can mean that you as a parent can get great insight into your child’s view of the world. By pretend play, the child may not necessarily have to narrate every incident to you (which they won’t narrate even if you stress them to). Yet, by their play, their mannerisms, and enactment of certain scenes, you can get to know how exactly they have been perceiving things around them. By engaging in pretend play, children often engage in play which needs cooperation and involvement from more than one person. For example, if a child is playing with a baby doll, and pretends to be a mother, they often need more characters to complete their play. This requires enhanced communication and emotional skills to complete the plot. In order to act or pretend, children would require to constantly think about expanding the situation. For example, if two children are playing doctor and patient, what happens next will have to be imagined. Whether the patient needs a bandage, or an operation (yeah we’ve all done those!) requires imagination. On the other hand, running short of players, the same child may assume the role of several patients with varying troubles, thus exercising the imagination of the child. Pretend PLay brings about a lot of challenges for the kids. What can they pretend to make? What can look like an umbrella? How to make a rooftop? How to drape a dupatta so it looks like a saree? What characteristic will make them look like their father? How to fetch some water and snacks for the tea party? How can they do all of this and not land into trouble? Constantly thinking and solving problems on the go is a great activity for a developing mind. As a parent, we often enjoy the pretend to play our kids devise, but sometimes it may get overboard. With the constant stimulation children receive from all parts of their life, parents cannot completely control what children see and what is their take away from the situation. There is no better use of the ‘corner of the eye’ sight than to use it for parenting. Pretend play or otherwise, It is great to leave kids to play by themselves, but it is essential to keep a monitoring eye on them. To always keep a watch from the corner of your eye is nothing but ideal! Undoubtedly, more than their siblings and friends, children love to interact and play with their parents. Join in as often as you can. Give wings to their imagination by improvising their ideas. Keep them a great company and it would encourage them to play. Being a parent is a delight (well, in most parts!) Just as the right values are important, so are the right kind of play to encourage proper growth and stimulation of the child. Always focus on being a fun parent first, everything else will follow! If you liked this article, SHARE it ahead!! This is interesting. My daughter has suddenly started being Spiderman every time with no initiation from my side. I think she has learnt from her preschool and I encourage her. This is one good post read in a while. Yes, I have always supported the roleplays but at times when my nephew tries to emulate ben10 it often gets very violent in that sense we also need to keep a check a lot. As of my daughter she has just started playing mother to dolls and softtoys. There’s more to come. But will share this post with my fam. 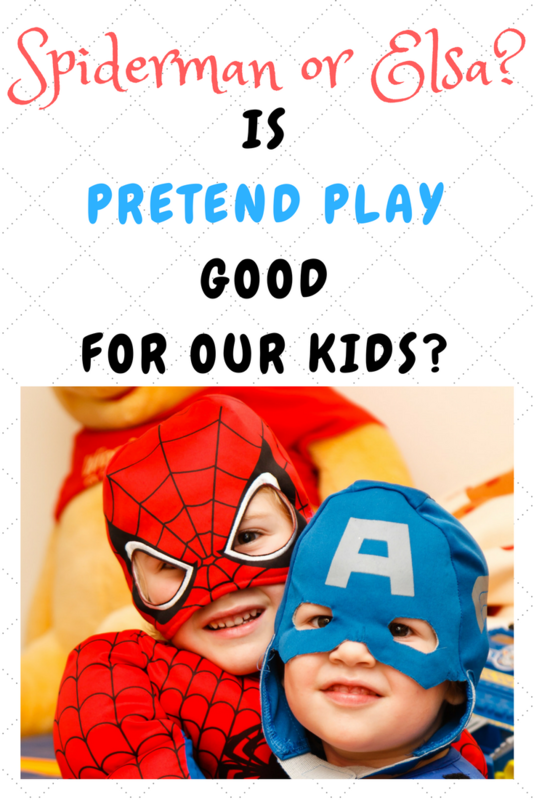 An interesting post I must say…I also think that pretend play is good. What they feel, what they think and what they want … they can express all these things through this playing. i have never stopped my kids from pretend play and probably that is one reason they are independent and dont depend on any toys. I so agree.. watching ur kids while they play pretend gives you so many insights into what goes on in their tiny heads.. I always supported role plays. .When I was a kid I always liked Spiderman. This is really so interesting to read. Oh yes, we love pretend plays too. But as of now doctor-patient and teacher-student are our favorites! We simply love pretend play and we’re more into feeding, kitchen, gardening….I guess next on Tots list is spider man. Pretend play is so important to keep them engaged and help learning simultaneously.. and your post is so informative.. I Truely agree this definitely boosts childs imagination and also emotional skills. Brilliant post. My son has recently started understanding pretend play. And I could see his imagination soar when he tells me showing a straw that’s it’s a rocket. The other day he used a crayon and told me it’s an injection and was putting it on my arm. So, yes pretend play is definitely an integral part of a child’s development, also it’s so much fun. Pretend play starts as early as 1.5 to 2 years and gets more fun by 3.yes capes masks costumes be it spider an superman. Or elsa with the hair extension et all. As parents let’s encourage children in their imagination creativity and problem solving skills by joining in and being a child ourselves. Fun and learn maketh well rounded personalities as adults. Loved this post! I have always indulged in pretend play! As we didn’t have video games… Loved the post! I love your suggestions ‘re pretend play. Being fun parent is most important so your child can enjoy your company while playing or in general. My son has started pretend playing too and he is more into lego duplo sets at the moment. My son loves playing with construction toys and he pretend plays a mechanic or sometimes a race car driver. He has a good collection of Matchbox and Hot wheels and as long as he is developing skills from anything he loves to do, we encourage him to go ahead. Great post prisha!